KKI.HU | On 9 April Péter Goreczky, senior analyst of IFAT participated at the One Belt One Road – China-CEE Relations in the 21th Century conference at Corvinus University, organised by the Central Europe Association and the Institute for Cultural Relations Policy. On 9 April Péter Goreczky, senior analyst of IFAT participated at the One Belt One Road – China-CEE Relations in the 21th Century conference at Corvinus University, organised by the Central Europe Association and the Institute for Cultural Relations Policy. 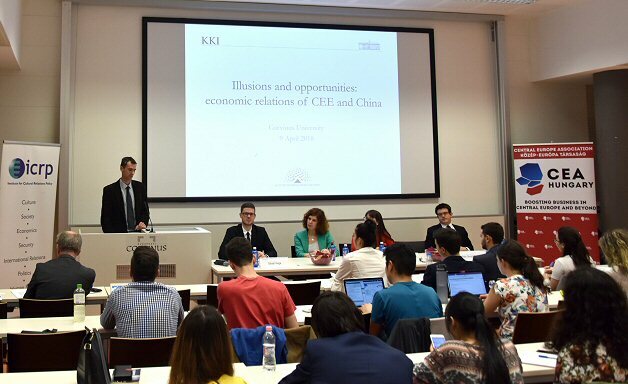 Main topics of the conference were the current develepment of relations between CEE and China with main focus on the opporutnities of economic and political cooperation. In the panel discussion the students of Corvinus University had the opportunity to address the lecturers with questions. Next PostPreventing the return of a failed state in our backyard. How to address the Libyan stalemate?